We were so blessed by the camp this year. Our efforts were greatly rewarded by the joy and fruit we saw in the young people. We would have to say that this year's camp has been the best yet! The kids came with anticipation about the days ahead. Each day was a mixture of crafts, games, devotions, Bible studies, daily prayer and worship. The Lord moved each and every day in the times of prayer and worship. There was a real cry in the Spirit as the kids gathered together in a circle on the floor to pray. We had postcards of missionaries we know and support, we prayed each day for these men and their families. We endeavor to put these men before the kids as a great testimony and the great privilege it is to be used of God. The devotions and Bible studies were very challenging and hands on. Seeing how this group was from the ages of thirteen to eighteen, we really pushed the message of "what do you believe?" and "how do you know what you believe?". The world we live in today has so many "brands" of Christianity, we have got to instill into our young people what is right before God. Not only instill it into them, but to the point that they believe it for themselves. We can't hold their hands the rest of their lives, we can't shelter them forever. They must know what they stand for and be strong in what they believe is right. The kids were asked to prepare a 10-minute message of what they would speak on if placed in front of a group of teens. They were giving assignments where they had to answer doctrinal questions and questions about their beliefs versus what others believe. We want to be able to put them anywhere in the world and have them be able to express verbally with conviction and passion what they believe. We really saw them have to take a step back and see where they reallywere, but we also saw a genuine desire to be taught and to embrace where they really are at and to grow in the areas they are weak in. On their all day field trip they were each giving an actual pound (a small burlap bag filled with rocks). Both camps were given this assignment. The "pound" was tied to their water bottles for the duration of the day. This was to represent the "pound" that Jesus has given to each of us. In the "Parable of the Talents" the master gave each of his servants a pound, he told them to multiply it while he was away. He gave each of them different amounts according to their experience. What this "pound" represents to us spiritually is our testimony before the world. It is our witness of Christ. Jesus left us here on earth and told us to multiply till He returns, He said, "Go and make disciples in all the world". We taught this to the kids the day before their field trip. The next day we passed out the "pounds" and told them these were to help them be conscious throughout the day (among the people and each other) that they are witnesses of Christ. Another neat thing the kids were asked to do (in both camps) was to prepare a 5 to 10 presentation about someone who has had or is having an "influence" on their lives. They were also asked to dress up like the person they chose. We really enjoyed seeing what they put together, their costumes were so authentic and their presentations were very well done. Since they came we have seen several of the kids still glowing from the times at camp. We are so blessed to be able to have the opportunity to influence their lives to some degree. We are excited and ready for next year! Who knows what God will have done by then! "What I liked most about this camp compared to all the other camps was the times of prayer and worship. God was really able to move on us. I also loved the assignments our instructors gave us, I loved the conversations I had with my friends as we studied. I learned more about my friends as we went through the camp together. I also really enjoyed the field trips and the games. But most of all I enjoyed the times of prayer. 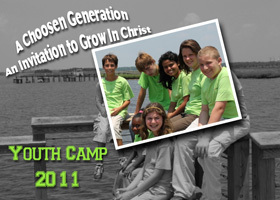 I am greatly anticipating the camp next year, I believe God will move in a greater way!" "This year I had a really fun time at youth camp. The day we went to the animal farm was my favorite outing. I enjoyed seeing the animals and the best part was the zip-line. I had a good time spending this day with all my friends and watching all of us attempt to run across the slip n' slide. I really liked the devotions this year also. I thought the subjects would be hard but actually it was rather easy because the staff took the time to break it down for us. My favorite part of the devotions was the game "On The Spot". It made you think fast and answer the questions easy. It took things that we know and made us put it into words as if someone off the streets cam up and asked us the same question. I really had a great time this year and I'm looking forward to next year's youth camp! "I really enjoyed the youth camp this year. The assignments and devotions were encouraging, and I learned a lot from them. I really enjoyed dress up day, it was great to hear what everyone had written about their heroes. Most of all I loved being around other Christians." We were equally as blessed by the camp for the younger children. Working with younger children is always more challenging, but we saw fruit from our efforts once again. We had most of the same kids from last year and we were very blessed to see much improvement from last year. Even though these children are younger we gathered every day to pray. Each child got to pray for a missionary, as we had in the first camp. As the staff shared with the children the some of the history and testimonies behind these men and women the children were really touched by what they saw in these men. We want them to see that personal sacrifice is a vital part of being a Christian, but though personal sacrifce comes the real fruit of God. The younger children were also challenged with more involved devotions and Bible studies. We were pretty impressed with how they responded, we sensed a sincere desire to be taught and to go deeper with God. Again, we have seen much fruit come out of the camp even today. A few of the children are pressing into the Lord in prayer and during the preached Word. We have several children from ages 7 to 11 years old who come every morning at 6:00am to pray for an hour during school and in the summer. Some of these children, even as young as they are, are the only ones in their families who are serving the Lord. Yet, despite the obvious obstacles we have seen them push through and continue to be faithful to the Lord in the mist of so much hell coming at them. We are truly blessed and encouraged by what we see God doing in their lives. We look forward to the next camp! "My favorite thing during the youth camp was the devotions. The devotion that really spoke out to me was "The Parable of the Talents". "The Parable of the Talents" says that God has given all of His children talents (a pound) and He might have given us a different amount, but He expects the same from all of us. He expects our best effort. I also liked it when we all got dressed up and talked about what person inspired our lives. I also enjoyed the prayer we had this year and how we learned about different missionaries around the world and what they are going through and the sacrifices they have to make everyday in their daily lives. This youth camp was my favorite out of all the ones we have had :)!!" "This year's youth camp was my favorite youth camp! What I really enjoyed was praying for the missionaries who were so on fire for God. When I heard about them it made me feel like I need to have a fire for God like they do. I also enjoyed the questions we were asked in our devotions because they were very interesting and even though some of them were hard we got a lot of help from the staff! I also liked going to the animal farm and playing volleyball and going on the slip n' slide, plus I really had a great time on the zip line!! For this youth camp you could tell that there was a lot of thought and prayer from the staff and our Pastors. I really liked how much time I got to spend with my friends!" "One of the things that I really enjoyed in this year's camp was the devotions. I've never really gotten into them like this year. I like learning about "The Parable of the Talents", I've never heard it before. It talks about how Jesus has given each of us "a pound" and He wants us to put our best effort into everything we do. I also enjoyed praying for all the missionaries. Seeing the love they have for Jesus and for others makes me want to have that too. We also went to an animal farm, I really enjoyed that. My favorite part was holding and petting the puppies, the slip n' slide, and playing volleyball. It was one of the best camps ever!" There is a voice of Truth which can be heard crying out! Whether lost or saved, we believe you will meet the living Christ through this ministry. In the midst of the darkness of this nation, you can still find a house where the Truth is preached with Clarity and Passion! If this website has blessed you please consider supporting this ministry. ©2011 ActsAmerica.org : A ministry of New Covenant Outreach, Inc.